We’d love your help. Let us know what’s wrong with this preview of I Love My Hair! by Natasha Anastasia Tarpley. To ask other readers questions about I Love My Hair!, please sign up. Be the first to ask a question about I Love My Hair! This is a great book that easily explains all the options there is for doing hair. Also, it makes every style sounds awesome and beautiful. Very young girl self-empowerment. A little but important and empowering book - obviously as the title tells us, this is all about girls loving their hair, despite the pain that all that brushing and combing can involve. Fun illustrations, accessible and meaningful for kids and a great resource for parents of young girls. In this book, the little girl finds pride in her hair and all the ways that she can fix it. I would use this book to teach diversity. I could use it during black history month or just in general to teach differences. It also teaches to be happy in the skin you're in. This book reminds me of my childhood plenty. As a young girl my mother had to take care of my hair. Just like Keyana, my mother or grandmother would sit me between her legs as the moisturized my scalp and styled my hair. As a child I usually dreaded getting my hair done. At times it was unpleasant, especially if my hair was sometimes snagged while combing out tangled areas. 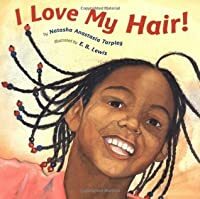 I Love My Hair is the story of a young black girl who learns to find pride in her hair, even though it hurts sometimes when her mother combs it. This book was excellent at showing the different expressions and emotions that African American girls have in real life when it comes to their hair. It also connects to all children, teaching them to love who they are and where they come from. This book tells the story of a young girl who learns to accept her hair. As females, we all have to learn to embrace ourselves, which is why I recommend this book be read to all young girls. This is a heartwarming story about a little girl and the reasons why she loves her hair. Sometimes though, having her hair brushed can be painful and Keyana doesn't like her hair then. But her Mama tells her how beautiful her hair is, and as she fixes Keyana's hair, she tells her stories of the past. Keyana tells her own stories about the reasons why she loves her hair, and through her stories we are transported into a world of dreams, belonging, and becoming! 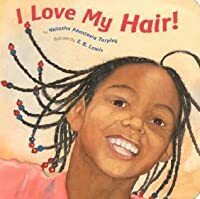 This is great read-aloud for young c This is a heartwarming story about a little girl and the reasons why she loves her hair. Sometimes though, having her hair brushed can be painful and Keyana doesn't like her hair then. But her Mama tells her how beautiful her hair is, and as she fixes Keyana's hair, she tells her stories of the past. Keyana tells her own stories about the reasons why she loves her hair, and through her stories we are transported into a world of dreams, belonging, and becoming! A wonderful story of acceptance for a very real important detail in the lives of young girls, their hair. This book shows the beauty in difference and can help girls to feel confident in themselves. The picture and text relationships that Natasha provides can really help to create a sense of identity and adventure for any girl that thinks their hair is more of a burden than a gift. Great read for young readers. As the title of this book implies, it celebrates a little girl's hair. It touches on how she and her mom bond over the maintenance of her hair (even though it can hurt when her mom brushes it) and how she can wear it in a variety of styles. The afro has history behind it but she likes to wear it with beads and hear the beads clacking together. This book promotes healthy and positive self-esteem and cultural identity. Children should feel comfortable with who they are, in order to feel comfortable enough to learn and play in a classroom setting. This book is a good book to have in the classroom to add a multicultural aspect. This shows how being african american is wonderful. This book is excellent to teach young African american children about self-love. It teaches one to appreciate who they are. It was also wonderfully illustrated. I love it. LOVE the story as well as the illustrations throughout the book! This book is told from a little girl's point of view as her mother creates different hairstyles for her. The little girl discusses which hairstyles she likes best, how they make her feel, and the tricks her mother uses when styling her hair. She is proud of the hair she has and it makes her feel like she can fly! I think this book is a wonderful book to read aloud to children because it discusses the important of being unique. The little girl in the story found so many wonderful hairstyles that o This book is told from a little girl's point of view as her mother creates different hairstyles for her. The little girl discusses which hairstyles she likes best, how they make her feel, and the tricks her mother uses when styling her hair. She is proud of the hair she has and it makes her feel like she can fly! I think this book is a wonderful book to read aloud to children because it discusses the important of being unique. The little girl in the story found so many wonderful hairstyles that only her type of hair could manage. All hair is different but all hair is good in its own ways! A book I would connect this to is, Bippity Bop Barbershop by Natasha Anastasia Tarpley. Both books show a child's appreciation for the hair that they are born with and alternate hairstyles they enjoy showing off. This is a great book for teaching body positivity and acceptance of natural hair. It starts by describing care given to african hair, and then the following pages are about accepting and loving her beautiful hair. It also mentions bullying, a very real problem, but the adult takes time to reinforce the beauty lf natural hair. Great message. It can be read to young children or read independently by children in upper elementary grades. Lovely title that depicts hair care and style options for young African American girls. Especially note that oil is being applied to the hair and there is a bonding experience happening between Mother and child as the hair care is accomplished. A good cross cultural title to learn about hair care that perhaps differs from ones own hair. Summary: Kenyana knows she has special hair and she loves it. This book is to make all African American girls to feel good about their hair and love it even though it is different. Evaluation: I like this book because it is simple, but powerful. It means a lot for an African American little girl to know she is different, but still feel good about herself. I think this could have a huge impact!! 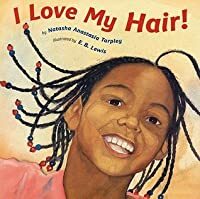 Teaching Idea: I would let my African American students read this book so they could feel good about th Summary: Kenyana knows she has special hair and she loves it. This book is to make all African American girls to feel good about their hair and love it even though it is different. This is a book about a little girl who gets made fun of for her African hair. Her mom teaches her that her hair is beautiful and unique and she becomes proud of it in the end. This would be a great story to read to the class if they are having an issue with someone personal style. “I love my hair because it is thick as a forest, soft as cotton candy, and curly as a vine winding upward, reaching the sky and climbing toward outer space. (n.p.) Keyana, a young African American girl, takes us on a journey explaining why she loves her hair. Although others don't quite get it, she remains sure that her hair is beautiful. Self love and having a good self esteem is very important especially for young black girls. The author lets those outside the black community get a through the “I love my hair because it is thick as a forest, soft as cotton candy, and curly as a vine winding upward, reaching the sky and climbing toward outer space. (n.p.) Keyana, a young African American girl, takes us on a journey explaining why she loves her hair. Although others don't quite get it, she remains sure that her hair is beautiful. Self love and having a good self esteem is very important especially for young black girls. The author lets those outside the black community get a through the lens view of what its like to have hair like Keyana’s. From the combing, the sitting position, the tears, coconut oil, to the teasing Keyana still loves her hair. This story hits close to home for me, growing up and getting my hair combed was always a tear jerker. I didn’t fully find the love for my hair until I went through years of unhealthy chemical relaxers, finally realizing that my natural hair was beautiful. My favorite part is where she talks about the sounds her beads make because I can recall this very sound from my childhood. Summary: This story starts off with a little girl getting her hair combed out by her mother, it gets very painful but her mom reminds her of how lucky she is to have this hair. She then goes into all the different ways she can wear her hair and how much she loves that she can do this. This book is a great way to boost the confidence of little kids who may feel insecure about the differences they have. Book Genre: I added this book to 1) multi cultural because it discusses about an African American little girl and the hair she has. I also added this to my 2) picture book shelf because the story has many pictures and each page is dedicated to a new picture. 3) realistic-fiction, although the story describes this little girls hair in unrealistic ways the story itself and the main concept is a very realistic story. Mentor Trait: The first mentor trait I added was 1) voice, the little girl does such a wonderful job describing her point of view and her feelings about the hair she has. 2) word choice, as the little girl describes her point of view she does a wonderful job of using descriptive words to make her hair come alive. Since desegregation of schools in the 1960s, our schools have become enriched with many different cultures, ethnicities and races. Understanding the concept of diversity at an early age will help children acknowledge and accept the differences that might not be similar to their lifestyle. The importance of self-awareness is demonstrated in’ I Love My Hair” by Natasha Anastasia Tarpley, Exhibiting descriptive details and also using realistic artistic approaches using pictures that shows the young Since desegregation of schools in the 1960s, our schools have become enriched with many different cultures, ethnicities and races. Understanding the concept of diversity at an early age will help children acknowledge and accept the differences that might not be similar to their lifestyle. The importance of self-awareness is demonstrated in’ I Love My Hair” by Natasha Anastasia Tarpley, Exhibiting descriptive details and also using realistic artistic approaches using pictures that shows the young African American child’s vivid imagination on how she starts to accept her hair differences amongst her peers. This book shows the creativity of the author’s use of imagery helping young readers create a vision of the child’s mind frame, which explains why this book was rated a #1best seller in Children's Multiculturalism, one of the best books in children’s book in 2014. Natasha Anastasia Tarpley gives insight on how Keyana learns self-acceptance while discovering her culture identity. Students from different ethical backgrounds can relate in a sense of maybe feeling alienated for looking different. At first she has a hard time dealing with the uncomfortable sensation of having her hair combed due to the tough texture. She feels awkward because students at her school once teased her because of her afro centric hair, however her mom embraces her, showing the uniqueness of her hair. She starts to accept how hair looks by visioning sounds that flow with the luster of her hair comparisons even her teacher wants her to embrace her hair because it represents her culture! I found this book to be very inspiring for early elementary students, primarily kindergarten to first grade. It’s important to instill culture value for children entering school, many students beginning in preschool will see differences amongst their peers that they might not be familiar, some tend to feel alienated from other students because of their outward appearance. Teaching students early about multicultural will help bring awareness to different cultures. Also this book is awesome example of self-confidence. This could be used to give insight on how important it is for students to value their beliefs, not being self-conscious but finding love within. Meaningful topic! The topic of hair is a very traditional one. The book can be used to open up discussions about self images children have. Trivia About I Love My Hair!